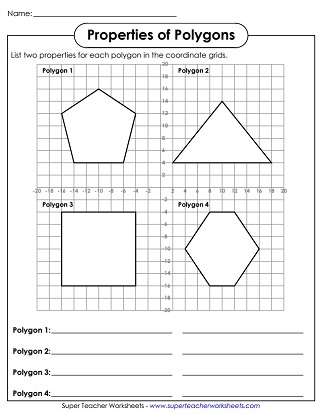 This page contains printable polygon worksheets. Flat shapes (plane figures) include triangles, quadrilaterals (squares, rectangles, rhombuses, parallelograms), pentagons, hexagons, and octagons. Mystery picture creates a triangle, quadrilateral, pentagon, hexagon, and octagon. 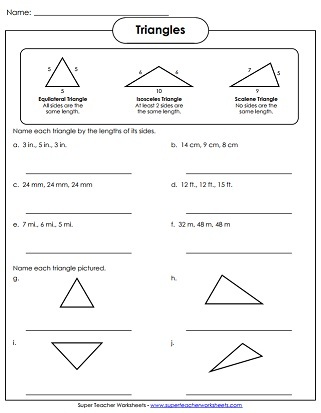 After revealing the mystery picture, students must color each polygon shape according to the instructions. 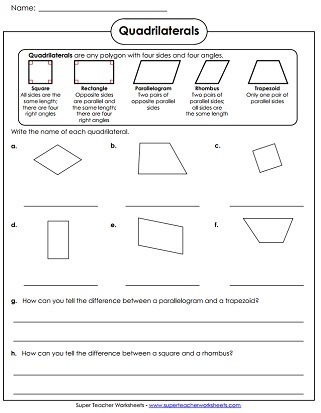 Write the answers to the questions about polygon shapes. Identify each shape. Includes solid figures (3D shapes) and polygons (flat shapes). In this card game, players match up the polygon or solid shapes with their names. Determine the number of sides, parallel lines, and right angles are in each polygon shape. List two properties for each of the four polygons shown on the coordinate plane. Color, cut, and fold the origami fortune teller (a.k.a. cootie catcher). Then play the game to review the names of basic polygon shapes. Use Microsoft Paint to create a polygon picture. Label the sides and angles on each polygon. Make flat shapes using toothpicks and clay. Keep track of the shapes build on the chart. Match the definition on the left with the quadrilateral type on the right. Identify the type of triangles shown: equilateral, isosceles, and scalene triangles. Identify the type of triangles shown: acute, obtuse, and right triangles. Cut out the shapes and glue them onto the t-chart. There is a column for flat shapes, and a column for solid shapes. Worksheets for teaching coordinate grids, ordered pairs, and plotting points.